VisWiz.io is a visual regression testing tool. It is designed to analyze and report any visual differences in your project on any changes. It does this by integrating with your automated testing process. Integrating your project with VisWiz.io is easily achieved using the following steps, with an account on our platform. To start integrating VisWiz.io, you need to use our SDK or our API directly. For either of these, you need an API key to authenticate yourself. We expose a REST API for all of our resources and actions. You can access the API from your favorite platform or programming language. For more information, please read our API Documentation. We currently have an official fully-fledged SDK/CLI for Node.js. For more information, please read our Node.js SDK Documentation. SDKs for other languages are also available: php, ruby, python, C#. To continue with VisWiz.io, you will setup your project in our system. Your account can have multiple projects. An alternative way to add a project is using our SDK or API. Most UI testing frameworks (e.g. Puppeteer, Selenium, Capybara) support capturing screenshots of the current page being tested. You'll need to add these framework commands in your tests to capture screenshots. The amount or the type of screenshots depends on your project's requirements - feel free to add as many or as few as you want. Once you have the actual screenshots from your tests, you can send them to VisWiz.io via our CLI (the easiest way), SDK (see sample code below) or API. For more in depth code samples, follow our tutorials: Puppeteer and Jest tutorial or Storybook tutorial. When a build is finished and all images have been compared, notifications with the build results are sent. By default, email notifications are sent out for new projects. Each project can have its own notifications configuration. Choose to receive either email reports or Slack reports or even both. 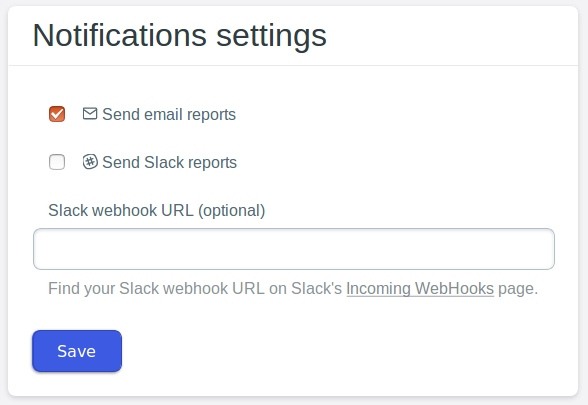 An alternative way to configure project notifications or webhooks is using our SDK or API. You can install our Github app to get notified about visual regressions directly in your pull requests. For more information, read our Github guide. The following code requires a valid VisWiz API key. When you create an account, your API key will be auto filled-in here. The following code uses your real VisWiz API key, so all the actions are performed on your account. After running the sample code, open your Projects page to see the new project. Remember that using our CLI is easier than using the sample code above.